Tasmania – Where on earth is it and why move there? Tasmania would have to be one of Australia’s least known destinations when doctors begin to consider making the move down under. Having lived there for the past nine years I can’t think why as it has to be one of the most amazing places that my family and I have ever lived…and that’s no lie! Tasmania, or Tassie as it’s known, is a compact state and home to a population of around about half a million people, exotic animals including the infamous Tassie Devil and spectacular unspoilt wilderness. And being an island it doesn’t matter where you are as you are never that far from the coast and the chances are that when you do rock up to the beach, that you could have it all to yourself! 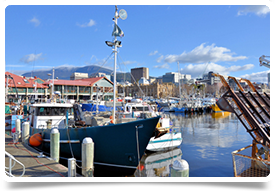 The capital, Hobart, offers a contrasting blend of heritage, scenery and culture. It is a river city and many of the most popular (and affordable) suburbs take in views over the Derwent River and estuary, after which the next stop is Antarctica! It is a cliché but the city really does have something to offer everybody and the best thing of all is that it is all accessible. Unlike other capitals there are no toll roads. You can drive from one side of the city through to the other in under an hour and traffic jams are rare. In fact across the entire state there are only 8 fixed speed cameras. For some cutting edge culture, why not head to MONA, the Museum of Old and New Art. Australia’s largest private museum it houses a diverse and thought-provoking collection. For some history explore Port Arthur, Australia’s most intact, infamous and evocative convict site. So what is on offer professionally for a GP looking to move? Clinically the scope of practice in Tassie is similar to that of a typical family practice in the UK or Ireland. And positions are rural (meeting the requirement for DWS) but not remote. Don’t get me wrong, you could also choose a GP / VMO role on King or Flinders Islands or the rugged west coast. For families there are excellent schools and the fees are a fraction of the cost of the equivalent in Sydney or Melbourne. UTAS (the University of Tasmania) has three campuses across the state and sporting activities and the outdoors are within easy reach whatever town you choose to make your new home. And finally, the question that everyone has – “But isn’t it freezing in Tassie?" Well, if you are up on the top of Mount Wellington in winter, yes, there is a bit of a chill in the air. But overall, no, it’s not. With a moderate climate and the longest summer evenings available in Australia (how nice is it to be out in the evening when the sun doesn’t set until 9pm), it can be simply glorious. Tassie has a stable climate in a world of global warming and wild weather events. The average temperature may look low on paper but this is deceptive, and average daytime temperatures feel a lot warmer than you’d expect. So when considering the weather as a factor in your relocation I can confirm that I have had some of the best storm free, flood free, humidity free and ‘too hot to do anything’ free days ever in Tassie! So why not consider Tasmania?